How familiar are you with contemporary pop music? Specifically the former country star, now pop princess Taylor Swift? Her song ‘Shake It Off’? Sing the chorus, but replace everything that rhymes with ‘ache’, with ‘bake’ and sing it a few times. That’s me in the showdown between my calendar and Thanksgiving in a few days. My bad, the next 2 days. Baking my life away, or at least my way through half of the family cookbook it feels like, and shakin’ off the stress it brings as we’re coming down to the wire time-wise. One of the last thing’s on my to do list, but also one of my favorite is to prep the rolls for dinner. 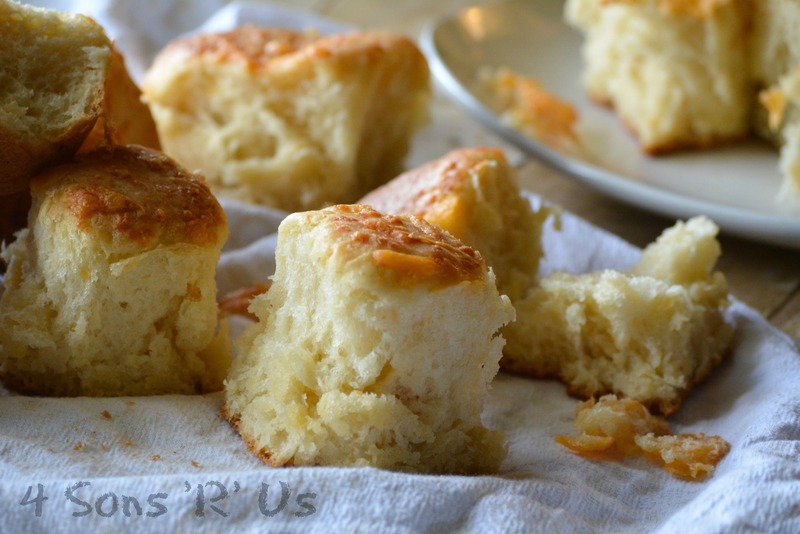 Fresh, fluffy rolls are a must at any Thanksgiving dinner. I mean, how else are you gonna sop up all that yummy gravy after the turkey and potatoes are gone?! Over the years, and several batches of trial and error, we’ve narrowed it down to two recipes that the whole family loves. One of which must be present at the family dinner- either our Pumpkin & Olive Oil Pull Apart Rolls or these Cheddar Potato Pull Apart Rolls. 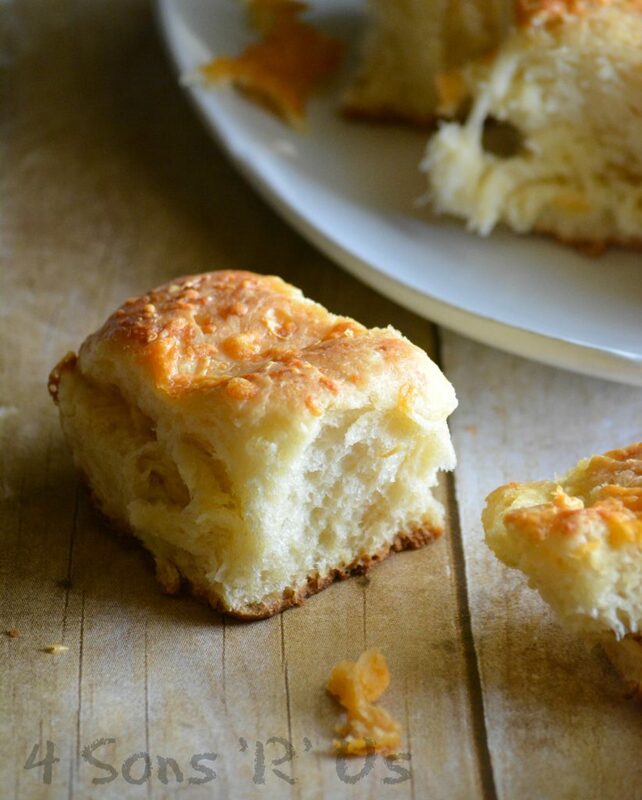 Light & fluffy, quick & easy, and did I mention that buttery crust with a crispy cheddar topping? 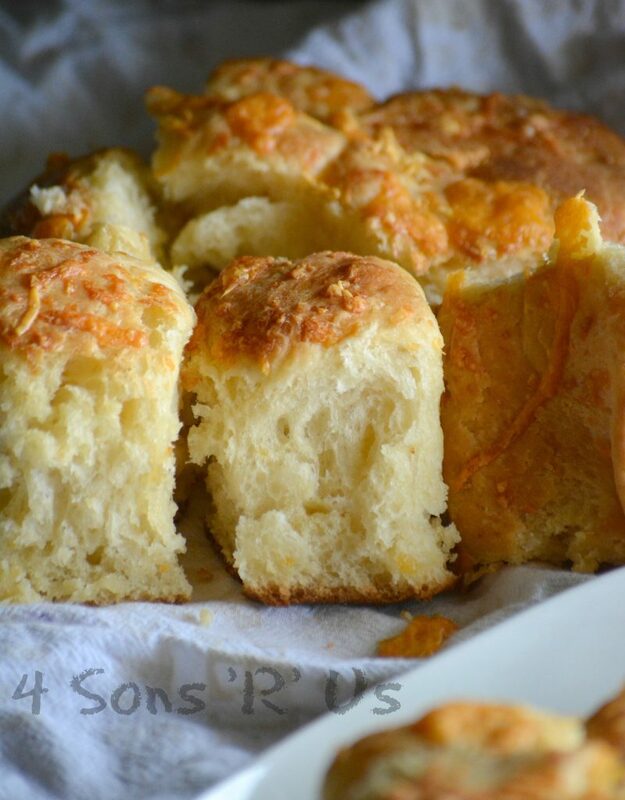 These Cheddar Potato Pull Apart Rolls are the perfect bread to serve as a side with any meat-centric meal. They’re also the perfect from scratch recipe for rounding out your Thanksgiving, Christmas, even Easter menu- without adding stress or anything time consuming to your already hectic kitchen schedule. They can be made ahead of time, or the day of– the choice is yours giving you options and flexibility when you need it most. To take another little blurb from Taylor, I’ll just say that “We are never, ever, ever…getting back together” to any and all store bought rolls when it comes to my special occasion and Holiday meals. Light & fluffy, from scratch pull apart potato rolls with a buttery, cheese topped crust- they're the perfect dinner roll to celebrate with. To a large mixing bowl, add the water, yeast, and 1 1/2 cups of the flour. Stir to evenly combine. Cover the bowl with plastic wrap, or a damp dish towel, and set in a warm place to rise, about 20-30 minutes, or until the starter's doubled in size and the surface has bubbled. In the bowl of a stand mixer, use the paddle attachment to cream together the butter, sugar, salt, and mustard until evenly combined, light & fluffy. Mix in the eggs and potato, again until evenly combined. Switch to the dough hook attachment (you can still use the paddle if that's what you have). Mix in the yeast mixture and 1 1/2 cups of cheddar until evenly combined. Mixing at low speed, slowly and in small amounts, mix in the remaining flour until the dough's pulling away from the sides and finally forms a soft, sticky ball. Lightly oil a large mixing bowl. Using floured hands, pick up the dough ball and shape it a little before transferring it to the prepared bowl. Turn the dough in the bowl to lightly coat it in the oil. Cover the bowl with plastic wrap and let the dough rise until doubled in size, about 1 1/2-2 hours. Lightly flour a clean, flat work space or counter top. Turn the dough out onto the prepared surface and divide it into 24 dough balls, shaping and dusting with flour as needed to not stick to hands. Spray a 9x13 baking dish lightly with cooking spray and arrange all the dough balls in it so they're all in it and touching slightly. Pull of a piece of aluminum foil that's slightly longer than the baking dish. Spray it lightly with non stick spray. Cover the dish tightly with the foil, oiled side down on top of the rolls. Bake the rolls at 350 degrees for 30 minutes, or just until firm to the touch. 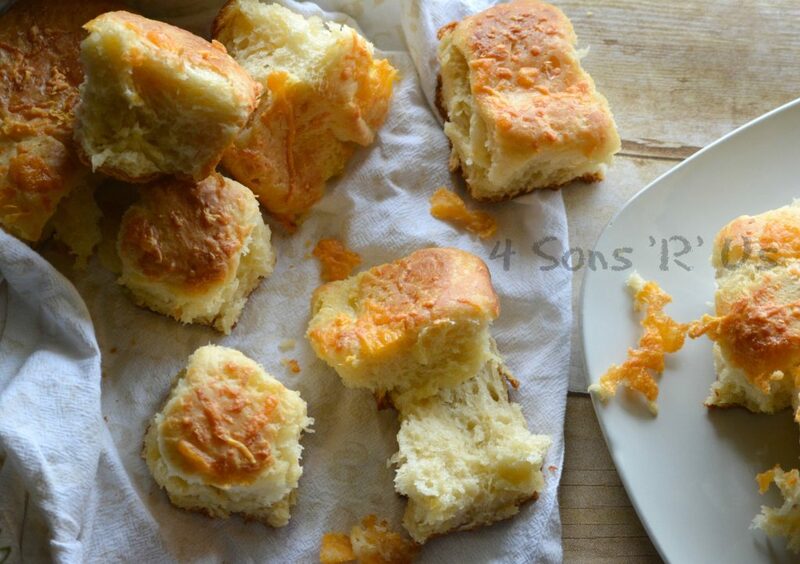 Uncover the rolls and brush the tops generously with the melted butter. Sprinkle the remaining cheddar evenly out over the top. 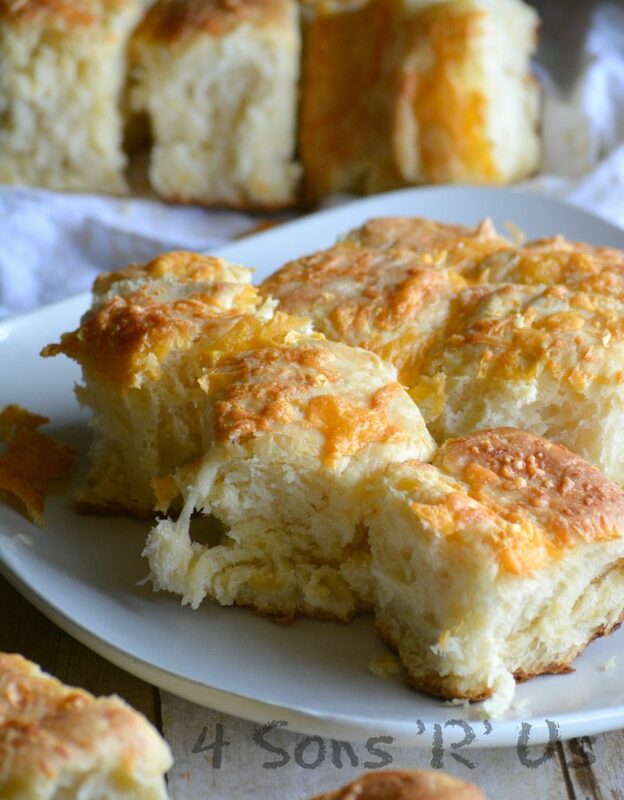 Return the rolls to the oven, uncovered, and continue baking an additional 20 minutes- or until the rolls are golden brown on top with crisp melted cheese. Let the rolls rest 15-20 minutes before pulling apart and serving. If you don't want to serve them pulled apart, line your baking dish with an overly long piece of parchment paper, and you can easily remove all the rolls in one go by pulling on the edges of the paper, post baking. To Make Ahead: Once you've got the dough balls arranged in the dish, cover and refrigerate overnight. Before baking, let the rolls sit at room temperature for 1 hour, or until puffy. Then proceed with the rest of the instructions. These are perfect for this week’s Fiesta Friday party. I am sure these will disappear easily. 😀 Thanks for sharing!